How are states responding to the growing trend of hospital system mergers? As health care consolidation increases, policymakers have to reconcile growing evidence that most consolidations raise prices with the political pressure regulators face to approve these mergers. Some states have responded by issuing certificates of public advantage (COPAs), a legal mechanism through which they can approve mergers that reduce or eliminate competition in return for commitments to make public benefit investments and control health care cost growth. In effect, a COPA creates a state-monitored monopoly—or a public utility model of health care delivery. 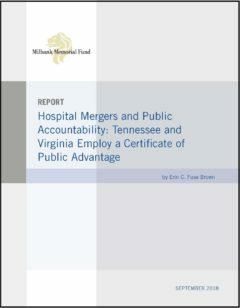 This report, written by Erin Fuse Brown of Georgia State University College of Law, describes the experience of Tennessee and Virginia, who used their COPA laws to approve a large health system merger that spanned their state borders. Rural health systems threatened by hospital closures could be shored up by the terms of a COPA. The state(s) need to define what success will look like for a particular COPA. COPAs are resource intensive to establish and oversee. Multi-state coordination is essential for the COPA to achieve consistent results. COPAs carry long-term political risks, and states need to be vigilant. This report explains how Tennessee and Virginia considered and ultimately issued their COPAs, including the legal authority and commitments secured for approval, and the states’ resources and coordination for on­going supervision. While it’s too early to know what will happen as a result of these states’ COPA decisions, state health policymakers and other stakeholders can learn from Tennessee and Virginia as they address future proposed hospital system mergers.